The kiwi, New Zealand's national bird, can be hard to find in the wild. Deforestation and predators have devastated populations of this small nocturnal bird. But you can keep a spotting on your vacation wish list because special "houses" throughout the country simulate the dark, damp conditions of their natural habitat in the forest at night. It's worth a stop at one for a glimpse of this fascinating flightless bird. Most of the kiwi houses and sanctuaries throughout the country also operate active breeding and hatching programs; they usually offer tours and information about this enigmatic creature. Visit Kiwi North in Northland to discover some of New Zealand's unique wildlife. The preserve maintains a state-of-the-art kiwi house where you can watch the birds forage for food as they would in the wild. 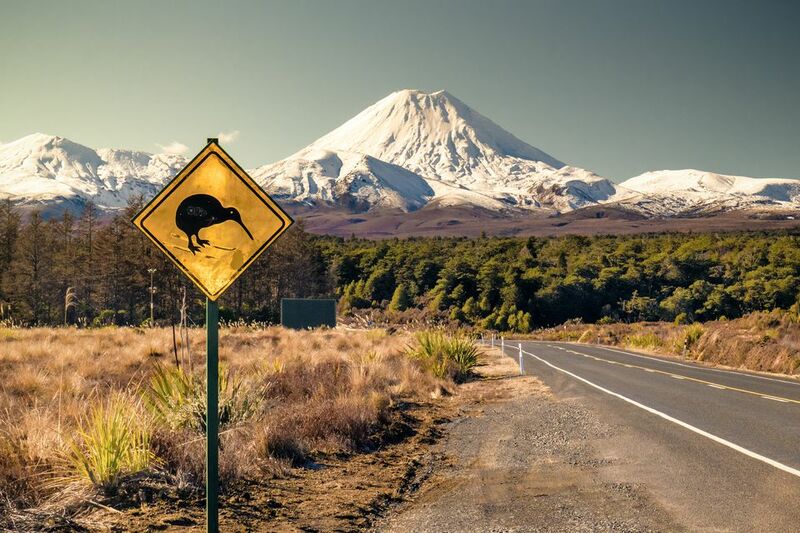 In addition to the kiwi, you will also find the tuatara (a native reptile dating back to the time of the dinosaurs); the morepork (ruru), New Zealand's native owl; and an endemic gecko. Make sure to stop in at the adjacent Whangarei Museum and check out the historic buildings at the 25-hectare Heritage Park. In New Zealand's largest city, Auckland, the zoo maintains a display called "The Night." This features several of New Zealand's lesser known nocturnal creatures as well as the North Island's endangered brown kiwi. The zoo was one of the first places in the country to see the bird in captivity, with the first put in place in 1971. The zoo participates in a kiwi recovery program called O.N.E., Operation Nest Egg, which involves hatching eggs in captivity then raising the birds on predator-free islands until they're fully grown, when they get released into the wild. Your admission to this important research and breeding center includes a guided tour of the nocturnal kiwi enclosure. As part of the Kiwi Encounter program, you can sponsor a kiwi chick hatched in captivity from a wild egg. The park's conservation efforts increase the rate of survival for kiwis in the wild from 5 to 70 percent. One of the oldest kiwi houses in New Zealand is part of the impressive Te Puia complex in the geothermal Te Whakarewarewa Valley in Rotorua, which includes a number of other natural and cultural attractions. The day tour here includes a visit to the kiwi house, along with an introduction to traditional Māori culture. Otorohanga might be the best-known kiwi house in New Zealand; it's located just 15 minutes south of the Waitomo Caves. You can observe the birds in their nocturnal enclosures and join a kiwi-watching night tour that allows you to see them in a more natural environment. In addition to the North Island brown kiwi, the most common captive bird, you can also see the great spotted kiwi and the little spotted kiwi here. Day is night and night is day in the kiwi house at the National Aquarium. By providing darkness for the nocturnal birds during the facility's visiting hours, the Aquarium makes a close encounter with a kiwi highly likely. The habitat closely resembles their native bush, with plantings and leaf mulch collected regularly from natural sources. Set in what was once a coastal swamp forest, this reserve contains a wide range of plants and animals. You can learn about the wildlife on a number of organized tours and test your night vision trying to spot kiwis in the reserve's nocturnal house. The Kiwi Guardians program encourages kids to get in on the conservation efforts with fun activities and opportunities to earn rewards. The kiwi house here is part of a wildlife sanctuary concentrating on breeding programs for some of New Zealand's most endangered birds. In addition to the kiwi (they successfully bred the only known example of a white kiwi in 2011), others include the black teal, kakariki, kokako, stitchbirds, and takahe. There are also native forest walks, guided tours, and educational displays. The Twilight Te Ao Māhina nocturnal house at the Wellington Zoo is home to three brown kiwis. During the daily Kiwi Talk program, you can get up close to Tahi, the world's most famous one-legged kiwi. This 80-hectare park is the only open-range zoo in New Zealand. It has a variety of exotic animals and a nocturnal house for the kiwi and New Zealand's native owl, the morepork (ruru). During the daily kiwi feed, you can watch the flightless birds forage for food while a guide teaches you about them. Home to a breeding program for the rarest of the five kiwi species, the Southern tokoeka kiwi, this Kiwi Center and aquarium also gives you the opportunity to feed 80- to 100-year-old giant eels and see New Zealand's living dinosaur, the tuatara. In addition to the nocturnal kiwi house, Willowbrook features a series of pathways and trails showing a wide range of animals and birds that inhabit the New Zealand landscape. You can also visit a replica of a pre-European Māori village, attend special events, and join various tours, such as the Christchurch Snow and Kiwi Tour, the Christchurch Maori Concert and Kiwi Viewing in the evening, or the Willowbank Wildlife Reserve Tour, which is a full day and also includes Christchurch and Akaroa highlights. Get the Kiwi Backstage Pass for a fully guided tour through the incubation and rearing facility, where you can see chicks from October to March. The West Coast Wildlife Centre is helping save the critically endangered Rowi and Haast tokoeka kiwis from extinction. Home to some of the best kiwi viewing in New Zealand, this park has infrared cameras providing guaranteed sightings in the artificial nighttime of the nocturnal house. There are five daily feeding times in the summer and four during the winter months.